Fashion Revolution Day is bringing awareness to the complex supply chain nestled quietly behind the beautiful clothing we see on the runway and on the racks. 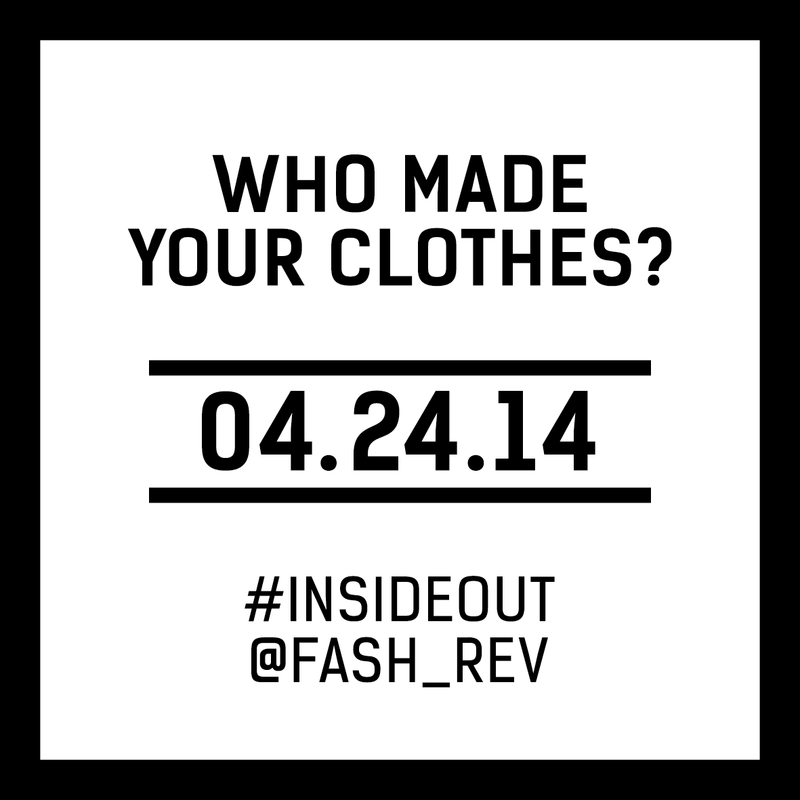 4.24.14 is the one year memorial for the Rana Plaza factory collapse, which was a wakeup call to the fashion industry. More customers caring about who made their clothing, means bigger efforts by brands to know their supply chain and the people involved each step of the way. Your first step is to kickstart the conversation - on 4.24 wear your clothes inside out and ask your friends Who Made Your Clothes? Fashion Revolution is asking people to wear their clothing inside out for an entire day to get some conversations going about the origin of what you're wearing. Oh there's even more incentive too...the photo shared socially with the most likes will win a $250 gift card to shop one of the sustainable brands aligned with the campaign. • Tweet the brand and ask Who Made Your Clothes? Include a photo if possible. • Contact the brand on Facebook and ask Who Made Your Clothes? • On Fashion Revolution Day 24 April, please Tweet: Today I’m wearing my (shirt/dress/T-shirt etc.) #insideout because I want to ask @ (brand/retailer) Who Made Your Clothes? • Make a video (see below) or send an email to the brand and ask them Who Made Your Clothes? • Tell us what you find out about Who Made Your Clothes? • Post/ tag/ like/ share it on your Facebook, Twitter and Instagram account.